← Eurozone electors have been sold a lemon! As election time draws near in the UK , and the US presidential election campaigns start to get underway across the Atlantic, we’ll no doubt hear a lot about this topic shortly, if we haven’t already. Apologies if you’ve heard this all before but the political and economic mainstream still don’t grasp it. Political parties will accuse their opponents of making “unfunded promises”, and of having “black holes” in their budgets etc . Nations’ finances will be likened to a household. Money coming into the Private Domestic Sector , which is essentially what we all think of as “the economy” can only be from two sources. 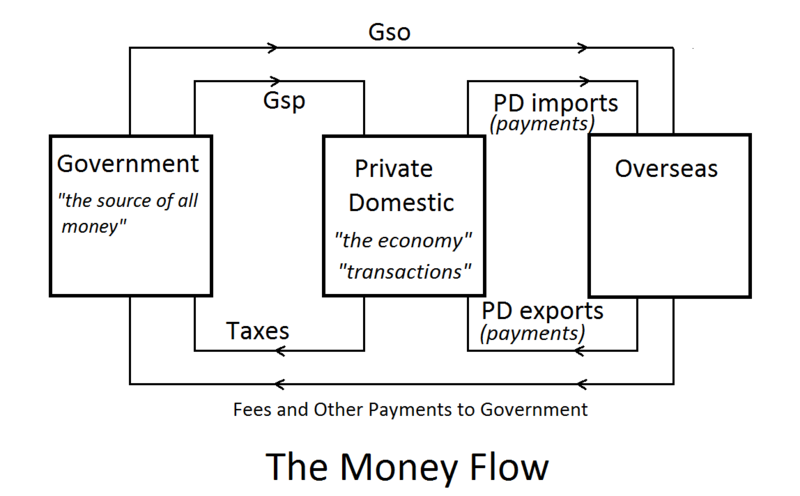 Government spending directly into it (Gsp) , and payments from overseas for exported goods and services. How can anyone possibly think that reducing Gsp isn’t going to affect Taxes paid? Every £ or $ collected in tax originally comes from Govt spending. The ability of the economy to deliver taxes to the government has to be directly related to its income. Reducing its income will make us all poorer and reduce our ability to deliver those taxes. Spending cuts won’t do anything like as much towards reducing that deficit as is usually supposed. How much simpler could it be? And yet if the “balanced budget” cretins get their way what will happen? The government will makes cuts, tax revenue will fall and the deficit will end up not much different to what it was previously. The cretins will then argue they didn’t make enough cuts and that they’ll need to make more on the second round. And so it will go on, with increased levels of unemployment and business failures at every stage. We just can’t let this happen. It’s madness. Instead of forcing the budget to “balance”, we should should look at balancing all the money flows to maximise our economic potential. This entry was posted in MMT General and tagged $1 billion, austerity economics, Balance of trade, Bank of England, Ben Bernanke, Borrowings and Lendings, British Labour Party, Budget Deficit, budget surplus, Central bank, Chartalism, Economy, Fiat Currencies, MMT, Warren Mosler. Bookmark the permalink. Nothing wrong with that diagram, makes things wonderfully clear, but the people who rise to the top of our legislature aren’t cretins, they’re intelligent ideologues. They want you and me to make the box on right of your diagram (trade) work harder and reduce dependency on the box on the left (Govt). The fine line between New Labour and the Tories is the rate and degree to which they’re prepared to shrink Gsp. Labour, due to its history, still has a more systemic view of the way society and economy relate hence they’re prepared to offer more Gsp to grow trade and thus jobs and the wider economy. An even deeper systemic view would include the relationship between environment, society and economy. I don’t see this as the difference between wrong (Neoliberal cretins) and right (intelligent socialists) but between narrowly drawn interests (UKIP at one end) and a deeper systemic understanding of how the ‘real’ (bio-physical) world works (with the Greens down that end). Thanks for your comment. I largely agree, but I’d just make the point that if the political mainstream were saying that the “box on the right”, ie increased exports/reduced imports, should work harder it wouldn’t be so bad. They’d have at least appreciated that the Government deficit and the trade deficit were linked. But, I haven’t heard this linkage explained in the MSM – although its a simple enough concept. Of course, Germany does exactly that. They are able to have a balanced budget because of their 7% trade surplus. Take that away and they’d either have Greek levels of unemployment or they’d have to run a significant budget deficit too. Another country running a large trade surplus at the moment is Denmark. The Danish private sector has lots of Krone coming into the economy from exports. But where do these Krone come from? Other countries want Danish exports but they don’t have enough Danish Krone as their trade is imbalanced. So the Danish Govt (via its central bank which is part of Govt) spends Krone in buying up foreign reserves on the exchange markets. So, overseas spending Gso includes bond purchases. Does this make any real sense? Why not just spend the money directly into the Danish economy instead? If Denmark exports pigs and imports sheep, does it make any sense to always swap 4 pigs for 3 sheep (assuming they are of equal value) and take an IOU to make up the difference? Maybe for a single year, but year after year? The poverty of understanding how money works appears to be related to “repayments” with few failing to understand, even if they know of sovereign government money creation powers, that full repayment of government created money through taxation negates the possibility of economic growth. Mysteriously private bank full repayment of money is not regarded as negating economic growth because money is brought forward from the future. The view is taken that sovereign government’s cannot perform this same trick and consequently be a part of a dynamic money circuit. The main reason why you shouldn’t vote for a party just because it promises to ‘Balance The Budget’. A Government that gets rid of a public sector deficit will simply cause a growth in the nation’s Private Sector/Household deficits. How does this fit with bank lending creating deposits? Do banks not create this money rather than it coming from government spending? Also, money coming from abroad does not affect the overall amount of £ in the economy. Those importers would have to exchange their currency for £ to buy the goods but that would not impact the amount of £ in the economy (though would impact the exchange rate). The banks create their own liabilities denominated in pounds. They can’t create government liabilities or ‘real government money’. They are no different to Casino chips in that respect except they are digital. In principle, if the Casino is fanancially viable those chips could function as money outside the casino too. You can’t pay your taxes with casino chips, though, and you can’t pay your taxes with bank liabilities. The bank has to cough up from its reserves to settle any payments by its customers to the govt. Yes, money coming from abroad does have an effect. If the Chinese wanted to spend all their accumulated £ too quickly then that would cause a fall in the value of the £, as you say, but inflation too. Say they wanted to buy lots of fish from the UK fishing fleet. The price of fish would rise to whatever the Chinese were willing to pay for it.